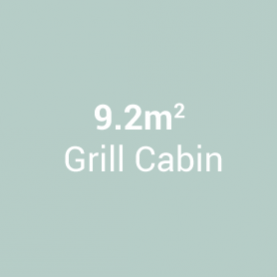 This optimal-size grill cabin is one of our more popular grill cabins, and is a perfect place to relax or hold a small party or family get-together. The space is large enough to be comfortable whilst still feeling cosy. 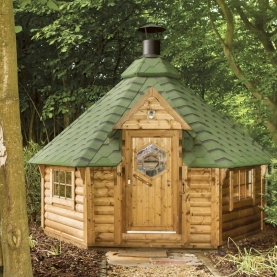 The grill cabin can be painted in a desired colour to perfectly fit your garden. 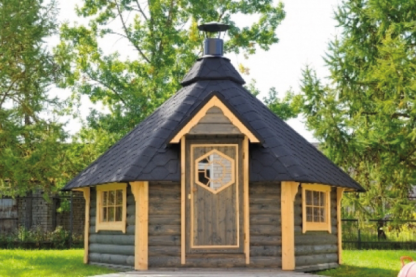 The cabin walls are constructed from rounded spruce boards, ensuring thermal insulation and a pleasant indoor climate. The roof is covered with bitumen shingles (available in a number of colours) and there are four opening, double-glazed windows. The main door features an original, decorative, hexagonal window and is lockable for extra security. Benches inside the cabin can comfortably seat up to 15 people around the warm charcoal or wood-fired grill, two of which fold out to become sleeping benches. 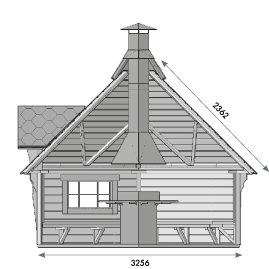 The chimney above the grill removes smoke from inside the cabin. Our package includes: a standard grill, 2 x deer hides, 1 x door sill, 2 x shelves, 2 x folding benches and standard curtains and cushions.